Dry Cleaning is always an option. Or you can hand wash in warm water, line dry then iron on the silk setting. For some pieces you can use the hand wash cycle of your washing machine. Following are a series of videos explaining the various techniques I use to create beautiful art to wear. Every piece is one of a kind. If you want it to be special and last, wear it for only special occasions. If you want functional beauty wear it more often and allow it to become performative. As it changes and evolves, the beauty inherent In the shibori technique will always be there, it will always be art and retain value. I love my art. If you want to trade up, let me know! The Shibori technique is based on manipulating fabric. The fabric resists the dye and creates a pattern. Arashi shibori, diagonal pole-wrap resist, is one form bomaki, pole wrap shibori. If you are intrigued by the arashi shibori technique and ready to pole wrap fabric this video will get you started. While I demonstrate using a large piece of merino wool, the technique also works for other fabrics and smaller pieces or scarves. In the video I use a 5’ long, 4” wide pvc pipe. I find this length easier to manage than a shorter pole. Ergonomically, my technique is especially good if you are going to be dyeing lots of fabric. Because I am able to stand up straight at a table 36” high I minimize physical effort or discomfort and maximizes efficiency. 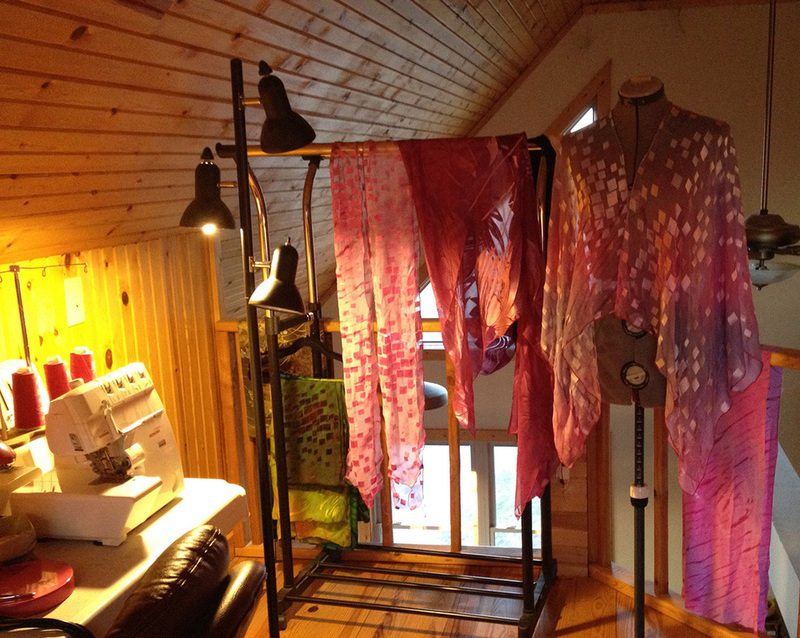 I love using silk charmeuse to create a 22 x 80” shawl. There are many ways to apply dye. If you’re wanting more complete coverage, this video shows how I have learned to read the flow of the dye. The secret to beautiful texture and blend of colors is to not use too much dye. Learn to observe the way the dye seeps into the fabric. If you want complete coverage, overlap slightly. Because I want lots of depth, I place at least three colors, or shades of one color of dye on the cloth. If you’re following color theory you will not get muddy colors. The secret to beautiful texture and blend of color is to not use too much dye. Learn to read the flow of the dye in the same way a kayaker reads the river before descending over a 40 foot water fall. Always overlaps slightly for complete coverage. I always place at least three colors, or shades of one color of dye on the cloth. This creates movement and depth. If you are fortunate to own or have access to a FeltLOOM, this video will show you how you can quickly create wet felted fabric with more texture for scarves or garments. After creating your pre-felt on the FeltLOOM using merino wool or alpaca and silk or cotton gauze and roving and running it through the FeltLOOM two times you are ready for this wet felting technique. Using the FeltLOOM first minimizes physical effort or discomfort and maximizes efficiency. This technique shows you how to use the dryer and save wear and tear on your body. If you have a FeltLOOM, it is easy to create large or small pieces of felted art or wearables. This video will show you how to create a long scarf using a 1/4 pound batt of merino wool. When you are finished you can arashi shibori the wool to get an interesting color with pattern and texture. And now the sewing begins. . .
And then there will be photos, either at home. . .